Deleted iPhone files by mistake? Upgrade your iPhone to the latest iOS 7 without backup? Or lost your iPhone? Take it easy. You can recovery iPhone data with free iPhone data recovery software. Yes, it's free. 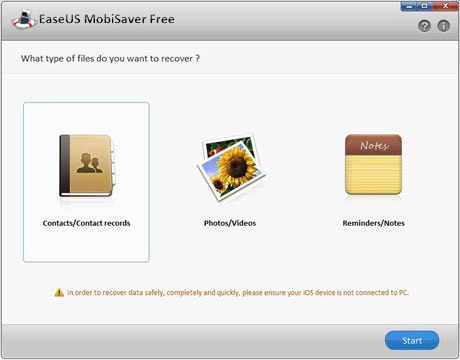 EaseUS, a professional data recovery software provider, has recently released the world's first iPhone data recovery software. This free iPhone file recovery software lets you easily recover up to 12 data types on iPhone - Contacts, Messages, Photos, Call History, Calendar, Notes, Reminders, Videos and so forth. iPhone 5, iPhone 4S, iPhone 4 and iPhone 3GS are supported. The world's free iPhone file recovery program. Supports overall iPhone data loss scenarios, including accidental deletion, iOS crashed, update without backup, iPhone damaged, iPhone stolen, and so on. Directly retrieve iPhone data even you don't have an iTunes backup. iTunes backup files will be automatically scanned and displayed. Preview contacts or messages in details in order to make sure you've found what you are looking for. Preview photos taken by your iPhone or iPad in camera roll. Safe and reliable. Non-destructive method to rescue data of your iOS device. No Spyware, Ads and Toolbar. 10 years expertise in data recovery. Wizard-like interface guides you through the steps to recover lost iPhone data. EaseUS MobiSaver Free only runs on Windows operating systems. So if you want to recovery deleted iPhone files on Mac, you need an iPhone data recovery application for Mac is required. 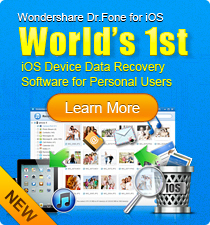 Wondershare Dr.Fone for Mac provides you with features similar to EaseUS MobiSaver Free. It also recovers iPhone photos, contacts, messages, call records, notes, etc. 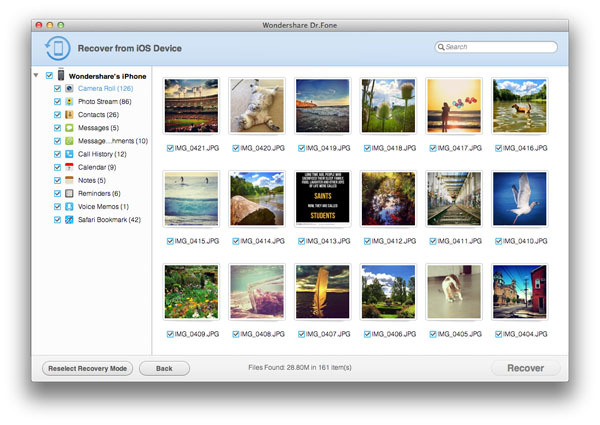 in 2 ways: Directly Recover from iOS Device and Recover from iTunes Backup Files. It runs on Mac OS X 10.8 (Mountain Lion), 10.7 and 10.6.